NHS Grampian wanted to understand the effect that demographic change and new clinical practice would have on the potential demand for CT and MRI scanners over the next 5 and 10 years. They thought they would need to buy new scanners to meet projected demand. With the cost of a new scanner at around £1m, this is a significant investment in healthcare at a time when budgets are tight. To test when new scanners would be needed, NHS Grampian decided to use the Scenario Generator tool which simulates population use of the health service and can model the impact of increasing demand on existing capacity. Various “what if” demand scenarios were modelled and showed the varying levels of demand which might need to be met. The model showed the queues building up when Grampian’s current capacity could no longer cope with the demand. NHS Grampian found that no additional capacity would be required over the ten year period if the impact of new clinical practice were not taken into account. 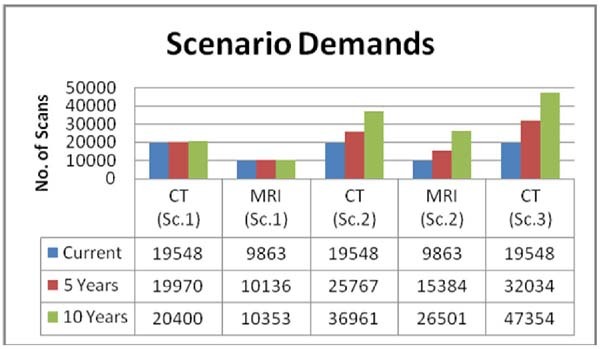 However when the model factored in clinical processes which will use scanners rather than other procedures, Grampian found that additional capacity would be required at several periods over the ten years to cope with the demand. The results showed that additional capacity would be needed for CT scans in 3 years, 7 years and 9 years time, and for MRI scans in 5 years, 8years and 10 years time. However when Grampian tested further scenarios which mirrored the use of the highest performing scanner, they found that for CT scanners, they would still need a new scanner in year 3, but would then be able to manage until year 7. Further, if they increased the utilisation of scanners to 7 days a week, it would be feasible to manage on existing capacity for a further 7 years for both types of scanners. Scenario Generator has provided Grampian with a means of understanding the effects of forecast increases in demand for scanners on current capacity, and help them understand when and how to invest. “This project has really helps us understand how to plan to ensure we have both the capacity and finance to meet our patient’s demands. We can really see the potential of using SIMUL8’s software tools to help us plan both investment and disinvestment in the future” – Jillian Evans, Head of Health Intelligence, NHS Grampian.